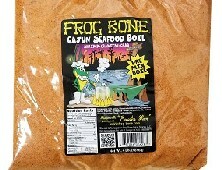 Home > New Orleans Food > Cajun Seasonings > Frog Bone Bayou Glaze BBQ Sauce, 12 oz. Frog Bone Bayou Glaze BBQ Sauce, 12 oz. Frog Bone Bayou Glaze BBQ Sauce The Frog Bone Bayou Glaze BBQ Sauce is a BBQ sauce unlike anything you have tasted before. This Frog Bone Bayou Glaze BBQ sauce is sweet without the spice. 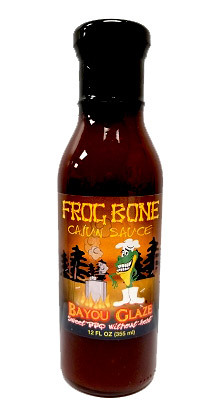 The Frog Bone Bayou Glaze BBQ sauce is similar to the Frog Bone Bayou BBQ but without the spice. There is so many different ways to use this sauce we cant even name them all. However you wont be disappointed with anything you put it on. Use it like a traditional BBQ sauce or use it like a regular sauce for cooking. What should I try it on? Great with everything and perfect for those who prefer less spice. It tastes great on all your traditional meats such as pork, ribs, brisket, chicken, hamburgers, hotdogs, and more. Try it out in some backed beans or to glaze a ham. The possibilities are endless! Frog Bone All Purpose Seasoning, 8 oz. Frog Bone Fire Roasted Salsa, 16 oz. Frog Bone Spanish Moss (White BBQ) Sauce, 12 oz.